Madonna is one of the acclaimed Queen of Pop, a recognition she earned through years of hard work, re-inventing herself to the changing times in the music industry and sheer determination. The American singer, songwriter, and actress has not only made name for herself but has also been an influence to so many entertainers. She has sold over 300 million records, which has made her the all-time best-selling female recording artist according to the Guinness World Records. Outside of music, Madonna is a renowned actress and has featured in well over 22 movies. Learn more about the versatile and interesting music personality below. Madonna was born and named Madonna Louise Ciccone on August 16, 1958, in Bay City, Michigan. She was born and raised as a Catholic by her parents but lost her mother to breast cancer at an early age. Madonna was traumatized by the tragedy but endeavored to channel her hurts into her pursuits which saw her perform amazingly well even in her academics. She schooled at St. Fredrick’s as well as St. Andrew’s Catholic Elementary School and West Middle School. She was a bit boisterous during her elementary school days, always seeking for the attention and admiration of his male classmates. She got enrolled in the classical piano class and would later take ballet lessons. Her ballet coach, Christopher Flynn talked her into taking a career in dance. For her high school education, she attended Rochester Adams High School where she sailed academically and in dancing too. She would later earn a dance scholarship to the University of Michigan, however, Madonna could not cope with the college and so she dropped out in 1978 and moved to New York. Madonna worked as a backup singer to some notable artists but would later join Patrick Hernandez as a backup in his world tour of 1979. Later on, she met Dan Gilroy and they had an intimate relationship and even lived together. Together, they formed the Breakfast Club with Madonna singing and also playing the drums. She would later leave Breakfast Club to join her later boyfriend, Stephen Bray to form another band called Emmy. Madonna later started her journey as a solo act and would impress DJ Mark Kamins who led her to Seymour Stein, the founder of Sire Records. She made her tentative entry into the music world with a singles deal she signed with Sire Records in 1982. She also released her first debut single titled “Everybody” in October of 1982. She has released 13 studio albums since then with the last one “Rebel Heart” released in 2015. Madonna has also featured in 22 movies, she also directed two movies; Filth and Wilson (2008) and W.E. (2011). As the world’s most successful female singer, her fame and success came with wealth. She sold over 300 million records worldwide according to Guinness World Records and she is the fourth best-selling act of all time, ranked behind Beatles, Elvis Presley, and legendary Michael Jackson. Madonna is currently worth a whopping $590 million. She is on the list of America’s richest self-made women. Madonna was born into a Catholic home of Italian-American father and French-Canadian mother. Her father’s name is Silvio Anthony Ciccone and her mother was Madonna Louise, having shared the same name as her mum, she was addressed as “Little Nonni” by immediate family. Her father was a Design Engineer at Chrysler and General Motors. The diva also has two older brothers named Anthony and Martin and three younger siblings name Paula, Christopher and Melaine. Her mum after battling with breast cancer died in December of 1963 when Madonna was just 5. Her father remaried their housekeeper (Joan) three years later who gave birth to Madonna’s stepsiblings – Jennifer and Mario. Madonna had a strained relationship with her father following his decision to remarry but they settled much afterward. Madonna, like most beautiful ladies in the entertainment industry, has had a stream of male admirers. She has had two with two different men – one of whom is her former husband, Guy Ritchie, an English filmmaker and businessman. They were married for eight years before they parted ways and that has been her longest relationship so far. She has been romantically involved with Dan Gilroy, a musician she met and lived with around 1979, and then had a short affair with drummer Stephen Bray. Madonna also got married to Sean Penn, an American award-winning actor on her birthday in 1985. She dated the Cuban Carlos Leon with whom she had a daughter in 1998. Abubakar Soumahoro (2016) was followed by Kevin Sampaio in 2017. Madonna is very passionate about children and has demonstrated it. She has a total of six children; her first daughter Lourdes Maria Ciccone Leon (Lola) was born October 19, 1996, and fathered by Carlos Leon, Madonna’s ex-lover and personal trainer. Their affair ended in 1997. She began another sexual relationship with Guy Ritchie, the British director in 2000, the couple had a son (Rocco John Ritchie), on August 11, 2000, and they got married around December of the same year. However, the marriage ended in 2008. In 2006, Madonna opted to adopt another son from Malawi (David Banda) amidst controversies; it was settled in 2008 after she got the approval of adoption rights over the boy. She did not stop there, in June 2009, she adopted another baby girl (Mercy James) from same Malawi, after several battles, she was granted custody of the baby girl making it her fourth Child. 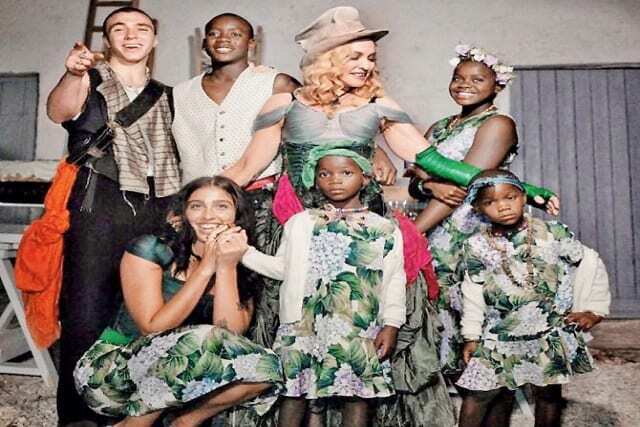 In February 2017, Madonna adopted four-year twin sisters (Estere and Stelle Mwale) from Malawi which brought the number of her children to six; two biological and four adopted. Madonna aside her singing, dancing, writing and acting talents is also a beautiful lady with an amazing body structure. She has got the body and height and has always flaunted them. She currently stands at 5 feet 4 inches which is said to be an average American woman’s height and she weighs 52 kilograms.